The Miami Heat have a couple of things going for them in Game 6—the current NBA finals trend, and the home-court advantage against the San Antonio Spurs. Those two advantages may seem flimsy, at best, especially the first one (“Judging by how the win has been alternating between the Spurs and the Heat from Games 1 to 5, Game 6 will logically go to the Heat.”). Then again, it’s apparent that this year’s NBA finals is anyone’s game, with both sides showing that they’re capable of blasting the other to utter oblivion. 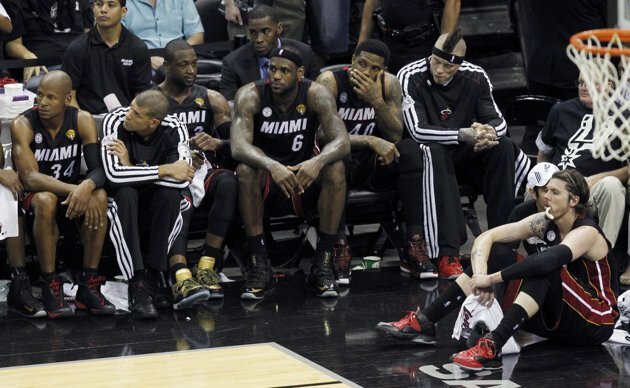 LeBron James, Dwyane Wade, and Chris Bosh know now that they can’t afford any slip-ups in Game 6. Not only will they lose a second straight title to the Spurs, but they’ll also lose face in front of an enthusiastic home crowd that goaded them to a 103-84 Game 2 win. And Miami’s Big Three have been stepping up, indeed. Ever since their crushing Game 3 defeat, James et al. have been aggressively playing a game of “who-can-break-close-scores-first” against San Antonio. Although the Spurs eventually won Game 5, the Heat did give them plenty of scares, especially in the second and third quarters. Miami would also do well to work out a strategy against Kawhi Leonard and Danny Green, as these two not-Big-Threes have proven crucial in tipping the scales in San Antonio’s favor. It’s essential that the Heat force a Game 7, which will also be held at home. Otherwise, they won’t silence the critics who say that the Spurs are a more solid team, while Miami is simply being carried on the back of three big men.